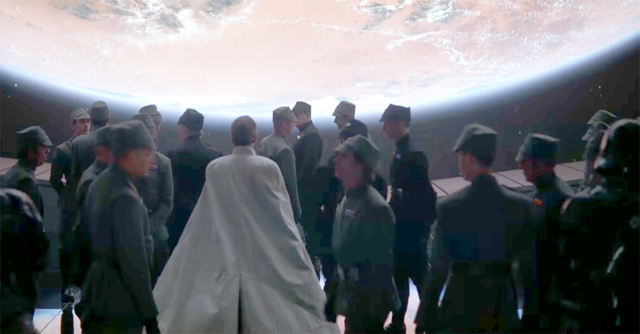 Second Look: Is the Empire a “White Supremacist” Organization? Should It Be? Mike: Many, many moons ago, before The Force Awakens and before the Expanded Universe reboot, our own Jay Shah wrote a piece entitled Senseless Sexism in the Galactic Empire. His premise, in short, was a) that the Star Wars setting offered no logical explanation for an Empire that actively discriminates against female officers, and b) that in practice the EU’s attempts to engage with the issue had been flawed to the point that it would have been better left out altogether. Jay was reacting to the simple fact that because Imperials are the bad guys—and more importantly, stand-ins for real-life oppressive governments—many are quick to ascribe any and all bad qualities to them. Surely there’s an anti-alien contingent, as witnessed in A New Hope and further supported by the prequel trilogy, but does the Empire actually discriminate against women, or people of color, as well? It’s easy to get that impression when every Imperial in the original trilogy is a white man (though the Rebels in ANH and The Empire Strikes Back aren’t much more diverse), but looking at their successors in the First Order complicates the issue—as do prominent non-film characters like Rae Sloane, who has largely been met with joy from fans for making the overall setting more inclusive, and demonstrating that anyone can be, well, “the bad guy”. Opposed by a multicultural group led by brave women. While nothing tossed off on Twitter (and since deleted) should be taken as canon, and it certainly can’t undo the existence of the powerful, serious black woman who becomes the nominal leader of the Imperial military after Palpatine’s death, I thought Weitz and Whitta’s comments (and let’s be real, the current events that prompted them) merited a revisiting of this topic. So I’ll put the question to all of you: as a separate matter from the “reality” of gender and race discrimination within the GFFA, which can never really have a definitive answer, is there value in explicitly, rather than allegorically, linking the Empire to misogyny and white supremacy? Can there be a sliding scale of interaction with real hate, or is it all or nothing?